Let the sun shine in as spring weather spreads across the country. 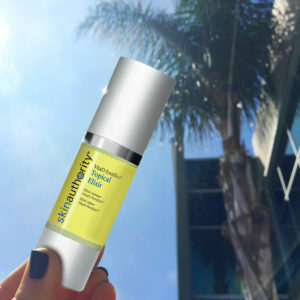 After a dreary winter, it’s likely you are heading outdoors as often as you can to soak up some Vitamin D. You can (and should) wear sunscreen and still get D.
Vitamin D is made in the skin and functions like a hormone. As we age, skin loses its ability to produce sufficient levels of vitamin D and appears dull, dry, discolored and less firm. The skin needs D to make D, thus, a real dilemma. To give everyone – babies to seniors – the benefits of a topical dose of D, we created the VitaD Fortified™ Topical Elixir. Our unique topical dose of Vitamin D is combined with a gentle retinol and powerful peptide complex. The result is a lightweight formula that produces luminous, healthy-looking skin and combats photo-aging. As with all Skin Authority products, the clean formula of VitaD Fortified™ Topical Elixir does not contain oils, parabens, dyes, fragrances, and is never tested on animals. Leslie is right and we’re making it simple for you to catch this healthy glow. Through April 30, you can receive $10 off your purchase of VitaD Fortified Topical Elixir by ordering here. This entry was posted in Healthy Lifestyle by Debra Locker. Bookmark the permalink.